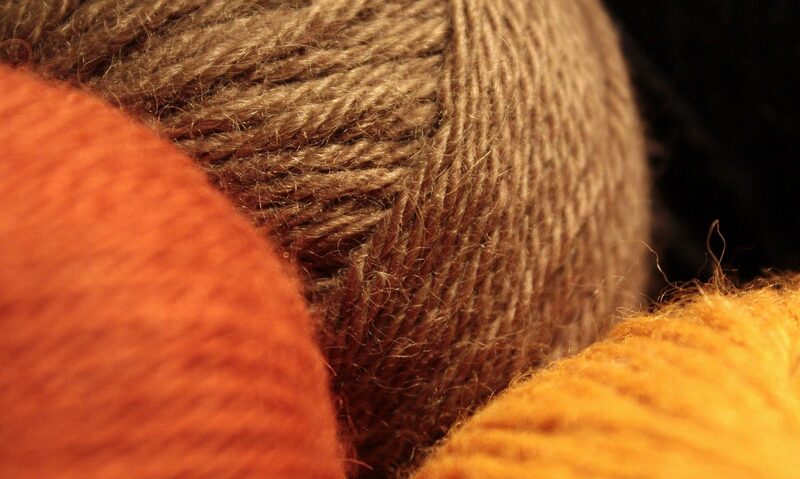 I’m knitting socks at the moment, out of a single ball of yarn – knitting the ball at both ends, as one might say. To avoid the awkwardness of having one short sock and one long one, I have both socks underway simultaneously – first foot, second foot, second leg, first leg. Unequal sockage duly avoided. What I have failed to avoid, however, are the strains of The S-Song of the S-Second S-Sock, floating through my mind. And since that song is set to the tune of The Gnu by Flanders & Swann, I have found myself proclaiming at intervals that I’m a gnu. Gnu waiting for horns to grow long enough to knit with. I confess: I generally enjoy knitting the second sock more than the first. All those anxious decisions are out of the way: toe-up or cuff-down? smaller needles? what kind of heel? is the foot long enough? or too long? and so on and so forth. The many variables are accounted for, and all you need to do is sit back and do what you did last time (only without the experimentation and back-tracking). That said, I have great sympathy for those who suffer from the dreaded SSS (Second Sock Syndrome) and in honour of their sufferings (and in the hope that said sufferings might be mitigated by a cheery work song) I have penned the following song. Or rather, the words to the song. For the music I am indebted to Mr. Donald Swann, as it comes from Flanders and Swann‘s king among ungulates, The Gnu, which can be heard here if you are one of those tragic unfortunates who has never heard it before. However: back to the socks. until reality took me down a peg. for the second sock began with me a feud. The blasted thing must be the size of a frock! But here I sit k-nitting away at my sock! but in the face of which my courage flees. (and that at least would solve the morning hunt). And so I sit k-nitting the second s-sock! K-nit, k-nit, k-nitting the second s-sock! Cats are creatures of habit, each with their own preferences of time and place for eating, sleeping, licking and so forth. But they are all united (including the big cats) by their favourite poses. Here are a selection of the classics. One of the most common cat poses, this features the cat couchant with front paws peeping out from beneath the furry chest. Unlike the ancient Sphinx, the nose is generally worn; and flinging passers-by to their death if they don’t answer a riddle correctly is hopelessly passé (as well as requiring rather more effort than the average sphinxing cat is prepared to exert). Suitable for use as a purring pose, but also lends itself well to regal disdain. This pose is a close relative of the Sphinx, but involves the curving inward of the front paws so as to produce a purely limbless appearance. To count as a true Cream Bun, the tail must be curled well in: the head must appear to be the only appendage the animal possesses. Also an excellent purring pose, and frequently indicative of that smug contentment that is quintessentially the cat. If properly placed, may result in the Monorail. As Anne Morrow Lindbergh wrote, “I saw the most beautiful cat today. It was sitting by the side of the road, its two front feet neatly and graciously together. Then it gravely swished around its tail to completely encircle itself. It was so fit and beautifully neat, that gesture, and so self-satisfied, so complacent.” Our cats sometimes vary the routine on cold days by tucking their tails under their front feet, so as to spare their tiny toes the horrors of the cold floor’s chill embrace. 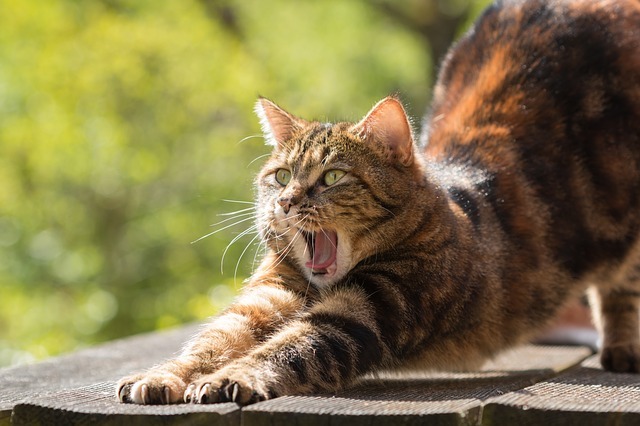 A stretch, frequently the first action of the cat on waking, during which the four paws are placed close together, and the mid-point of the cat is pulled up as high as possible. The cat may then proceed to another stretch, pause for a wash, or decide that waking up was a bad idea and return directly to a sleeping position. Note: due to the close placement of the paws, there is no room for a hedgehog to pass through the hoop, even when guided by a flamingo. Do not try this at home, or, indeed, anywhere. This is a pure sleeping position, although some cats foolishly attempt to make it a purring position and end up sneezing out their own belly-fur. Ideally, the tail is curled over the head to form a complete circle of spine enclosing the more liquid elements of the cat. Advanced practitioners take care to position themselves so that onlookers can discern no feature in the mass of fluff, although the difficulty of neutralizing the second ear is widely acknowledged. 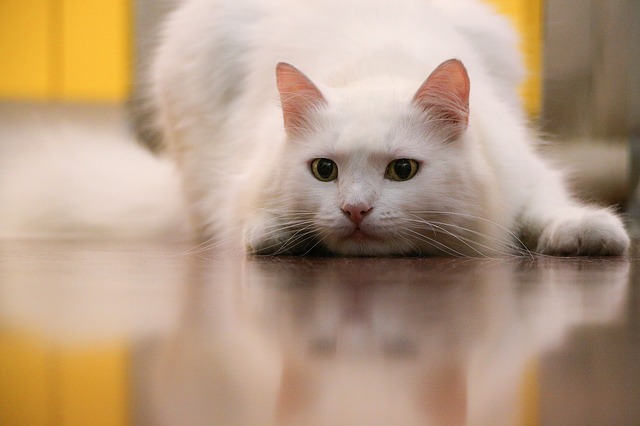 Despite the name, cats seldom take this position on a hearthrug. It is more frequently seen on warm days when a cat realizes that its solar cells are fully charged and further lingering in the sun may lead to spontaneous combustion. (Cats are strangely attracted to heat, considering the dictum that heat is work, and their total avoidance of the latter.) The cat will then flop down on a cool piece of floor – preferably in a high-traffic area – and pretend to be dead until a suitable level of heat transfer has been achieved. The full exposure of the belly may lead an inexperienced person to assume that the cat is proffering its belly for a rub, but they will soon learn their error as the cat snaps shut about their arm like a bear-trap. This pose is seldom used for purring, sometimes for sleeping, and invariably for nursing kittens. the Reverse Slingshot, or Fire! in which the bulk of the cat moves forward and only the very tips of the back toes remain behind, as though the front half of the cat is walking away and the back half has not yet got the memo. Generally followed by a nonchalant foot waggle, as though the cat were shaking your dust from its feet – which takes some gall, since your dust is probably mostly their discarded hair anyway. The cat then strolls away, in search of food or a more inconvenient location to take a bath. the Rev, performed when preparing to pounce. Similar to a Slingshot stretch, the front is carried low. The posterior is well aloft and is swayed from side to side. This is equivalent to a race-car driver revving his engine at the starting line, and is presumably performed to work up enough static electricity to power the hind-legs in that all-important initial bound. Our ginger cat does remarkably well with his hunting, given that he always gives his prey notice by sticking his fat orange bottom in the air and waving it about like a Belisha beacon trying to hail a taxi. This list is of course by no means complete, so do feel free to contribute your own observations in the comments!